Founded in 1988, the Leipzig String Quartet is now widely acclaimed as one of the most exciting string quartets on the international chamber music scene: The “Neue Züricher Zeitung” has described the ensemble as “one of the towering and most versatile quartets of our time” and in 2002 “The New York Times” wrote “if there is a Leipzig sound, this is it!” Three of its members were first chairs in the famous Gewandhaus Orchestra of Leipzig. 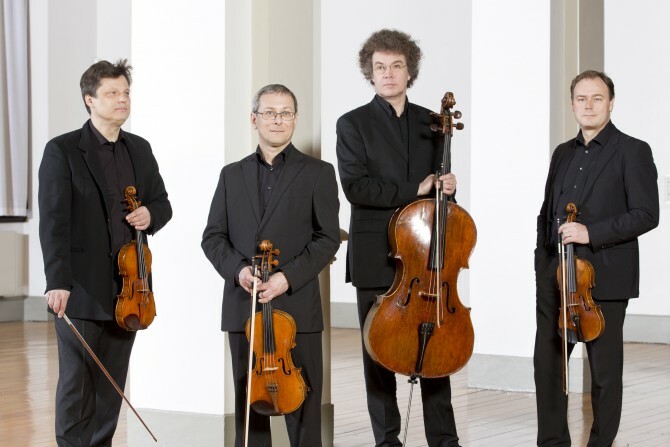 After studies with Gerhard Bosse, the Amadeus quartet, Hatto Beyerle and Walter Levin, the quartet went on to win numerous prizes and awards, such as the 1991 International ARD Munich competition, and the Busch and Siemens prizes. Today, the Leipzig String Quartet concertizes extensively throughout Europe, in Israel, Africa, Central and South America, Australia, Japan and Asia, including appearances at many of the major festivals. In North America, engagements include appearances at Lincoln Center’s Alice Tully Hall, at Carnegie Hall’s quartet series in Weill Recital Hall, the 92nd St. Y, The Frick Collection, Wolf Trap, the Library of Congress, and chamber music series in Baltimore, Boston, Cleveland, Chicago, Los Angeles, Salt Lake City, Vancouver, Ottawa, Montréal and Quebec, earning them praise for their concerts: “superbly integrated” (Washington Post); “everything, but everything, was perfect” (Le Devoir, Montréal). Often offering its own thematic cycles (Beethoven, Mozart, Schubert, the contemporaries), the quartet was also one of the initiators of the 1996 and 1997 Beethoven Quartet Cycle offered jointly with five other quartets as a sign of European friendship in more than 15 European cities. Since 1991, the ensemble has has its own concert series “Pro Quatuor” at the Gewandhaus where it offered, among others, a multi-year cycle of the major quartets of the First and Second Viennese School. Within that series the quartet played the world-premieres of Schnittke’s “With Three” for string trio and orchestra and works by Beat Furrer, Christian Ofenbauer, Wolfgang Rihm, Steffen Schleiermacher, Jörg Widmann, Cristóbal Halffter and others. As a member of the Leipzig-based “Ensemble Avantgarde”, the quartet is dedicated to contemporary music and works by the classical moderns. 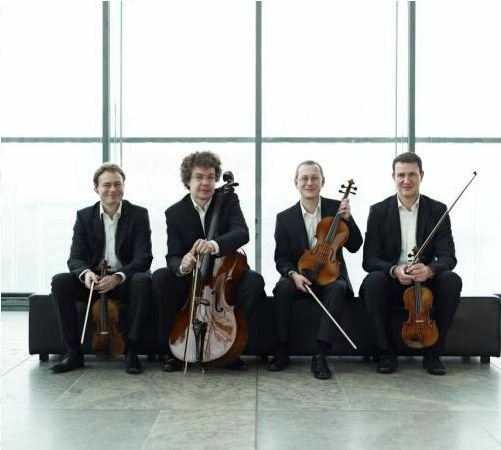 With this ensemble, the quartet formed in 1990 the “musica nova” series at the Gewandhaus, and was awarded the 1993 Schneider-Schott prize of the City of Mainz. Chamber music partners Juliane Banse, Christiane Oelze, Alfred Brendel, Barbara Buntrock, Menahem Pressler, Michael Sanderling, Andreas Staier, Christian Zacharias and others enrich and expand the quartet’s already large repertoire consisting of almost 300 works by approximately 100 composers. The quartet’s almost 90 recordings, spanning from Mozart to Cage and including the complete works of Brahms, Mozart, Mendelssohn Bartholdy, Schubert and the complete Second Viennese School have been met with international critical acclaim. They have brought the group such recognition as the “Diapason d’Or” and “Premios-CD-Compact” awards, two nominations for the “Cannes Classical Award” and the 1999, 2000, 2003, 2008 and 2012 “ECHO-Klassik” awards. Their recording of the complete Schubert quartet literature, a first, are considered by many the most important release for the Schubert year 1997. Of 18 recordings of the “Trout quintet”, the French magazine “Répertoire” voted their recording with Christian Zacharias, piano, as the best recording of this work. Repeatedly, the quartet won the Quarterly Prize of the German Record Reviewers, the last for their recording of Hindemith’s “Minimax” and the Quartets of Kurt Weill. Since 1992, the Quartet records exclusively forDabringhaus&Grimm Music Productions (MDG). Since 2009, the Leipzig String Quartet is invited by maestro Claudio Abbado to be member of the Lucerne Festival Orchestra and teaches as Guest professors at the Tokyo University of the Art (Geidai).